The new FG Falcon showcases Australian car manufacturing talent - in terms of its engineering and development, the Falcon is the ‘most Australian’ of the cars built in this country. But unfortunately, the FG Falcon also showcases why the Australian car industry is currently in so much trouble. With only one important exception, the design priorities of Ford Australia are simply not those of the majority of buyers. 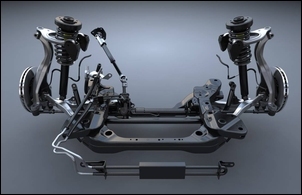 For this new model, Ford spent an enormous amount of money developing a new front suspension. And the FG Falcon handles extremely well - there’s bags of grip, and the electronic stability control is also very well calibrated. But you have to ask - why did they bother? Ford Australia also spent an enormous amount developing a newly styled interior. Unfortunately, it’s a design that breaks no new ground – in fact, it is demonstrably well behind contemporary best practice. There is nothing – absolutely nothing – in the cabin that is outstanding design. But it’s easy to find clear deficiencies: the bottle holders integrated into the front door pockets are hopeless (and, believe it or not, the rear doors don’t even have any pockets! ); the fuel and coolant gauges are tiny and are buried in the lower corners of the instrument panel (people with poor close-up vision will barely be able to see these gauges); as with the previous Falcon, the speedo and tacho use cluttered markings - the best evidence of this is how the gauges are much easier to read at night when the awkward colours and details are no longer visible; neither the glovebox nor the centre console box are cooled by the air-conditioner – something now the case in many much cheaper cars; and a decorative silver stripe across the dash badly reflects sunshine into the front occupants’ eyes. 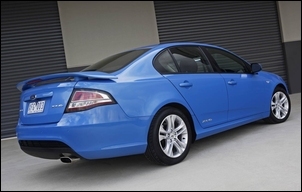 And perhaps it was because of the dark colours of the interior trim in the test $39,990 XR6, but the cabin simply doesn’t feel airy and spacious – instead it is enclosing. It’s not just perception either - some dimensions are actually quite tight. For example, across the driver’s knees, we measured a width of just 55cm. That’s narrower than you’ll find in many cars with much smaller external dimensions. But the biggest indication of Ford’s wacky design priorities can be seen in the car’s fuel consumption. If performance was scintillating, there might be some excuse for the thirst. 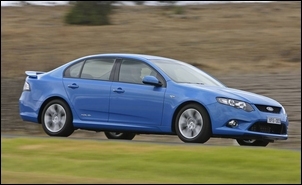 But in response and acceleration, the Toyota Aurion feels stronger. And of course that makes sense: the Aurion has more power than the Falcon (200kW versus 195kW), weighs less (1590kg versus 1704kg) and has a 6-speed auto trans as standard versus the Falcon’s 5-speed auto (a 6-speed auto is a $1500 option on the Falcon). And in our testing, the Aurion also got clearly better fuel economy than the Falcon – see Toyota Aurion AT-X. In fact, the only area that the priorities of Ford and the public really seem to coincide is in safety. 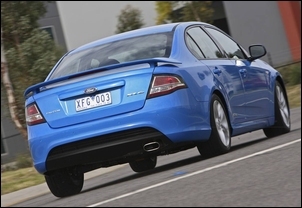 The FG Falcon has gained a 5-star crash test result and with that excellent standard stability control, is also more likely to avoid crashes. And it’s not just the interior design, thirst and performance - the Falcon has still more negatives. Firstly, the steering. The Falcon uses steering that has a very slow ratio around centre. The ‘sneeze factor’ (you can sneeze, yank on the steering wheel, and not go off the road) is large: drive along at 100 km/h and wriggle the wheel and nothing much happens. However, the corollary of that is it’s hard to judge where you are when entering a country road bend, especially one of gentle radius. You tend to turn-in with several bites of steering, then adjust steering angle mid-corner. This steering behaviour is much less noticeable in city conditions – there the variable ratio and tight turning circle make the car feel wieldy and responsive. Finally on the list of negatives, build quality of the test car was nothing special. The paint had clear ‘orange peel’, the margins (gaps between adjoining panels) were not even, and the doors shut with a hollow clang. So apart from handling and crash safety, is there nothing good about this car? Well, there are some unambiguous positives. The LCD positioned in the centre of the instrument panel is a model of clarity. 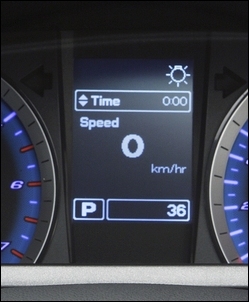 It’s easy to read and can display a wide variety of selected information, including a digital speedo. The range of data means that almost anyone will be able to configure it to show something that is useful to them. Another good feature is the facility that allows user-adjustment of a variety of body computer functions (eg whether the horn beeps when locking the car, when the interior lights switch off, etc). The cruise control also works very effectively. It digitally displays the selected speed and its ‘resume’ function is beautifully smooth. The selected speed is also well maintained – to the extent that the gearbox will down-change to provide engine braking when descending hills. The seats are very comfortable. The backrests of the front seats initially feel too firm (and the head restraints are very firm!) but the seats maintain their comfort, even after hours in the saddle. The rear seats are also very good, with a lot of under-thigh support. Rear foot- and knee-room are both excellent, although tall people will find their heads very close to the roof lining. 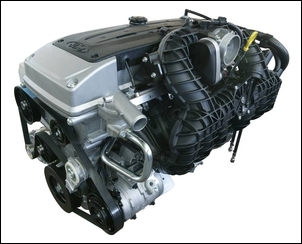 NVH – noise, vibration, harshness – are very well suppressed. When hot, the engine starts with a loud, gruff noise, and on some bitumen surfaces the large 245/45 tyres are noisy. However, in most driving, the car’s refinement is exemplary. Finally, the boot is large. Ford persists with a design that has a deep depression in the middle - that is, the floor isn’t flat. This approach suits suitcases of a specific size, and pretty well all soft bags. The rear seat folds 60/40 but leaves a stepped floor. 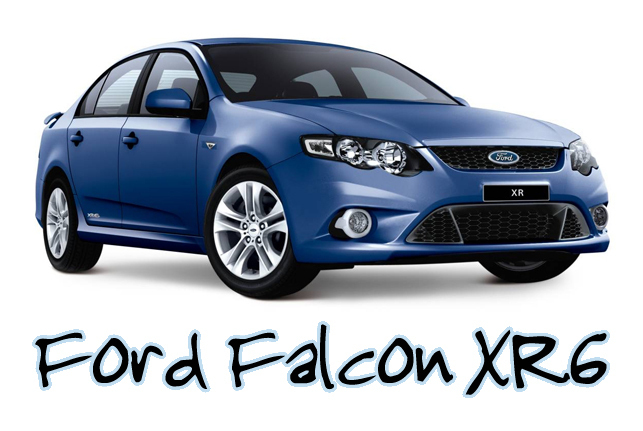 The Falcon XR6 was hired for this story.